During the holiday season last year, I felt that I couldn’t get all the work fired that I needed to fire. I think part of that is knowing how and when the clay is ready to process and not to push it too fast. 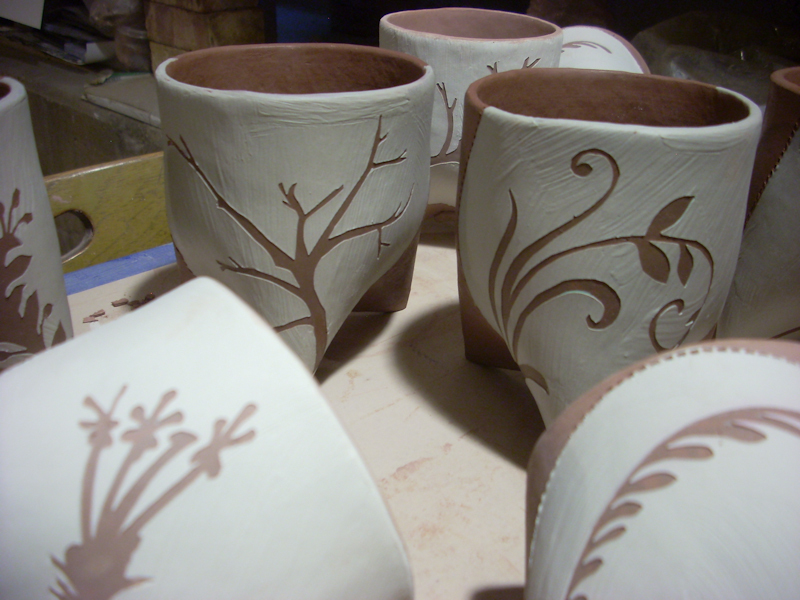 But, I also didn’t feel that I had the kiln space to push the work through. 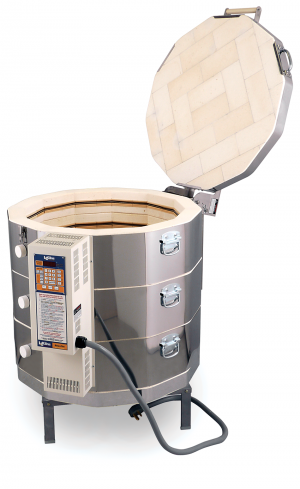 So, I have ordered a new kiln from The Kiln Doctor and hopefully, in 2-4 weeks, I will be up and running and working harder to fill it up. The kiln that I currently have is over 35 years old. It has, and continues to serve me well but I feel that I need to upgrade to a programmable kiln and to give myself a bigger goal to work toward. The old kiln will still be used for smaller firings or to do the bisque work. It will continue to be in the basement. I inherited this kiln from my mother-in-law, many years ago, after she tried her hand at ceramics as a hobby. Originally, the plan was to add a small building to the upper side of my studio to house the kilns. Due to money constraints, I am needing to add the kiln before I add the building. When we renovated the studio, we had the electrician run the wiring for the future kiln and those wires are available on the upper side of the studio, in the wall. Hopefully, he can extract those wires from the building and extend them out to the building that we call the “garage”. The garage has a concrete floor and a good size space to accommodate the larger kiln and then the next upgrade can be a new building so that I am not having to carry work between buildings for the different phases of the process. I can also put the glaze compressor in the garage and get it out of the garden pump room where it currently is. For now, the kayaks and the mower will have to find a new home until we can afford a kiln room addition onto the studio. The new kiln is now going to be three times the kiln that I currently have and so I hope that, with my skills improving, and my desire to make larger items, that I won’t have any trouble filling this larger space. Growth is good and this is part of the process of growing the business. and onto the shelf. More new work to put out for previewing. Just a quick post this morning to let everyone know that I am doing an event this Friday night in Woodstock, VA called Vintage Woodstock. I have never been to this event, but it is local, and I am trying to be as local with my new work as possible. If you are looking for something to do this Friday evening, head to Woodstock, and stop in and see my new fairy garden items and new mug designs. Laguna Clay company makes a black clay, WC-391 to be specific, that I have been playing with for several months now and have been having some issues with. Not wanting to give up on it I thought I would do a post about it in hopes that if any other potters, who are also using this clay, read this post, they might offer some ideas. My creative thought process was that if I could put the colorful water treatment of the frog bowls on the interior of the black body, sealing it in with a clear glaze and leaving the exterior of the bowl the raw black matte clay body that it would be a really dramatic look. So that is what I set out to achieve. I bought the clay, threw 6 large bowls with it and decorated them with white slip on the interior of the bowl along with the colorants that I have been using. Adding my signature frog sculpture to the rim in all his personality, I loaded the first batch into the kiln and fired it just like I have been doing with the brown and the white stonewares that I am using. Allowing the kiln to cool for at least 12-16 hours, I opened the kiln to find wonderful bowls that were warm to the touch but at all hot. I set the bowl out on the shelf to continue unloading and within minutes the bowl that I had just unloaded makes a loud bang noise and upon when I go to the shelf the bowl has broken in such a way that it has experienced thermal shock. The interior of the bowl looks like it has been twisted and separates. The bowl continues to make noise for several hours following, telling me that as it continues to cool it is really going through some additional changes. If this were the brown or the white stoneware that I use this wouldn’t happen. The first time it happened, I thought it was a throwing technique problem, that I wasn’t compressing the clay enough to compress the molecules within the body on the wheel. So I tried again. Going back to the basics of throwing and following my hands through the process making sure I compress the clay with a rib before lifting the walls of the bowl. Fired the bowls, same problem. This makes me realize that the kiln needs to cool longer. So I let the next kiln set for an additional day before lifting the lid. This seems to work. However, an additional problem that the clay has that I don’t know that I can fix without just lots of testing, is the lack of ability for the clay to adhere to itself when I score and slip of two pieces. Spending plenty of time on the construction to make sure that the seams are sealed properly and securely doesn’t seem to help this problem either. After I had spent several days on a sculptural rectangular vase vessel, making sure that seams were sealed and smooth, the bisque fire opened up the seams leaving large gaps in the joints. I had noticed this also on the small fairy garden furniture that I had been making when I would make a butterfly bench and attach the legs to it they didn’t want to hold at the joint. I have been known to push the limits on projects and materials and I believe that I was pushing the limits of this clay body as well. Laguna lists the shrink rate of this #391clay at 10% with a 2+% tolerance. The white body that I use, #609, on the interior of the black clay has a shrink rate of 13%, I’m sure, is putting stress on the interior of the black clay. Without doing a lot more testing, I am afraid to sell the items that worked. I don’t know if the item will break after a person puts the mug into a microwave or puts the bowl into an oven to warm or cook food in it and I don’t want to put someone at risk. I have the adorable mugs with the frog on the exterior that I am afraid will pop off due to the two clay bodies not getting along enough to hold each other’s joint. When I went to the Kiln Doctor on Saturday to buy more clay of all the colors that I use, I did buy more of the black clay and spoke with Mike, the owner, about the problems that I had been having. It just so happened that he was going to Seattle to a conference and Laguna Clay would be there. He took the information from me and planned to talk to them about it and find out if the chemistry of the clay is the problem and if they knew of anyone else that is having similar issues. In the meantime, I will hold onto the items that I’ve made so far and not sell them and only make small fairy garden items out of the black clay for now. Hopefully, Mike will bring some answers back from the Pacific Northwest this week and I will keep testing the wares before I let them out of my studio. Just to be safe!